As the characteristics of a neighbourhood can affect the experience of a homeowner, the features of a garden can affect the wellbeing of its plants. Noisy neighbours can disrupt life, whereas quiet neighbours can allow for relaxing living. In order to run a peaceful garden, the needs and wants of each plant must be met and its environment must be tailored accordingly. Companion planting, also known as intercropping, is a common way of ensuring that the environment of a plant is beneficial to its well being. It has been practised all over the world, and enables a plant to reach its full potential. 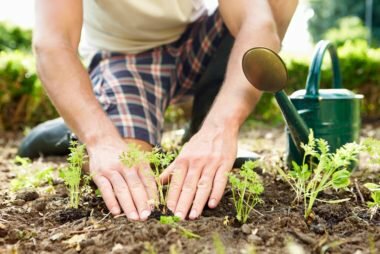 Here is a short guide to companion planting that will help you started with this wonderful technique. It may be daunting, but starting a garden focused on companion planting is quite simple. Plants need good soil and water, as well as access to the sun. Invest in a good sprinkler system and some fertiliser to get you started. This is especially good for those with little time to work in the garden, and is complementary to growing a low-maintenance garden! This tip will ensure that your plants will always have access to the nutrients necessary for their survival. This next tip is a simple one: when undertaking companion planting, attempt to intersperse the plants as much as possible. Large groups of identical plants tend to attract pests, which damage and sometimes destroy gardens. Mixing up the plants avoids this issue. The other benefit of interspersion, is that there will be more effective nutrient exchange between companions. Recent research into this area reveal that some companions share root systems, which may be more effective if the plants are closer together. An interesting benefit of companion planting is the ability to use plants as a way of deterring pests. An example of this is the use of garlic to deter the Japanese Beetle. There is a downside, as garlic will inhibit the growth of plants in the pea and bean family, so care must be taken. Each garden is different, and will respond differently to companion plant growth. The changes in pH, temperature and microorganisms mean that, while some pairings may work for others, they may not work for you. For this reason, don’t be afraid to experiment. Try different companion pairings on a smaller scale and assess their growth. If they thrive, try it on a larger scale! If not, have a look online and try a different pairing. An example of excellent companion planting is demonstrated in the Native American practise of “Three Sister Planting”. The three sisters are corn, beans and squash. As the corn grows, the stalks form a scaffolding which supports the upward growth of the beans. These beans release nitrogen, which is essential for the growth of squash. The crowding of the soil does not lead to competition between the plants for nutrients. This is because each plant has a root system that delves deeper than the other; each is searching for food in a different place! This technique results in a larger harvest, and food of a higher quality. Great plant companions can be found online, and there are many to choose from. There is bound to be a combination that suits your garden. The benefits of companion planting are abundant, but you won’t reap the reward until you try it yourself! So whether you were born with a green thumb, or if you are just breaking into the gardening world, give companion planting a go. You won’t regret it!